Sail Fish was a gem of a find. A quick 1 minute boat ride across the canal and you are a 10 minute walk to town. The room was perfect, a bed and a table, just the right size for 1. The room was clean and even had a bug screen in the doorway, just what I needed so I could sleep with the door open. The shared bathhouse was always clean and the pool and swim up bar were well stocked and clean as well.Their resident dog was friendly and loved to play catch. Amazing stay, amazing location and staff! Felt very welcome at this hostel and safe. Had a lovely time hanging out by the pool and speaking to the staff. Will be recommending to friends and family travelling to Placencia in the future!! Stayed in the private room - it's small, but is a clean bed in a private and quiet setting. A clean, safe spot with courteous staff and a nice relaxed vibe. 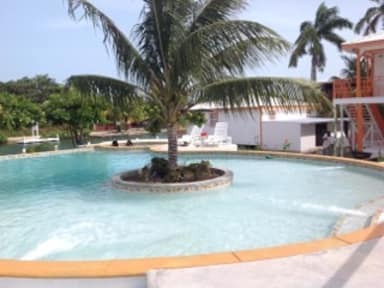 Perfect for a quick stay in Placencia! We really enjoyed our stay at Sailfish Resort. The staff was excellent and helpful. We loved the swim-up bar and the bartender, Clinton! The double rooms were a bit small and the women's restroom needed a bit more care, but overall it was a fantastic stay and I would definitely stay here again. Really chill place, nice pool. Very clean, cute pup running around named Einstein. Staff is great, coolest manager ever. Really great place! The location was amazing and the pool was divine. The opened the pool and bar even though we were the only guests. There is a huge TV in a common area that does have sports channels (we stayed during nba finals so that was clutch for the bf lol). Only complaint was the trash in the bathrooms. They weren't changed before or while we were there. Problem is the trash attracts a LOT of mosquitos so going to the bathroom became pretty awful after about a day. 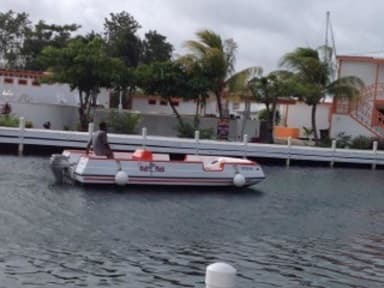 Loved it, and their host manager bartender boat driver and trip advisor Simone! Will return next year for sure. Biggest issue is that the beds are just foam, and gross foam at that. Small issues are the wifi does not work inside the room but works well at the pool and near the owner's home, the hostel room does not have any type of locking door and there are no lockers to place your stuff in so be sure to bring a lock for your backpack or luggage. For it being the most expensive hostel I've stayed at I was not impressed. This "hostel" is located on an island and requires the host to pick you up and drop you off via a water taxi. While they are reasonably responsive, it is an inconvenience nonetheless and was not clear how to call on them when we arrived at night. The location is a 10min walk to the main village and beaches. The bathrooms had many flies and mosquitos, some dead/killed and left on the toilets. The host miscommunicated with us multiple times and failed to clear his meaning until the last minute.